Bird watching at Phulchowki is one full day tour from Kathmandu Valley. The trip begins early in the morning with scenic an hour of drives to the Godavari Botanical Garden. Set on foot from here to the onward destination Phulchowki. 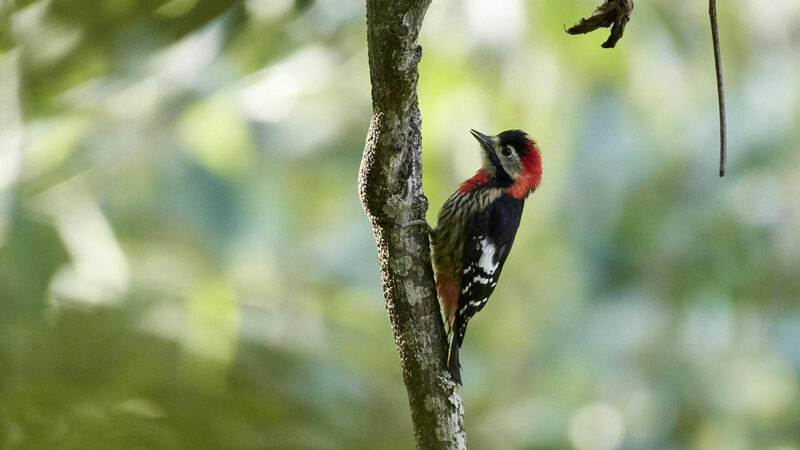 Our bird expert guide will be assisting you to recognize the beautiful birds found in this dense forest. First of all, begin the walking by searching the birds around the garden and slowly hike ascending to the top of Phulchowki Hill. 265 species of birds have been recorded in this route including Rufous-bellied and Crimson-breasted Woodpeckers, Rusty-cheeked Scimitar-babbler, Rufous Sibia, Rufous-winged, Nepal and White-browed Fulvettas, Green-tailed Sunbird, Cutia, Blue-winged Minla, Stripe-throated and Whiskered Yuhinas, Red-flanked Bluetail, White-browed Bush-robin, Dark-throated Thrush, Grey-winged and White-collared Blackbirds, Buff-barred and Black-faced Warblers and a great many others. Our bird expert guide will meet you early in the morning at your hotel. Then, a short brief about today's activities. Carry a packed breakfast and lunch from the hotel and proceed to dig up the local birds at Phulshowki Hill. A short an hour drive to the Godavari Botanical Garden will give us the glimpse of the natural green dense forest we will be observing today. From here we will walk along the trail that reaches us at the top of the hills, Phulchowki. If the weather permits, one can have a mesmerizing view of the lofty snow-capped mountains ranging from Annapurna to the west, Langtang in the middle up to the Everest in the east. Our guide will be assisting you to recognize the birds that are found en-route. After completing the trip drive back to the hotel. Bird Watching Tour finished here! Kathmandu to Godavari and back by private car. A professional bird expert guide. Expenses occurred due to strike, political unrest etc. Rest of all that are not mentioned in cost included. Wants some modification on Phulchowki Bird Watching Tour itinerary? contact us to customize it.